(1) Verify that your motor position blocks are correct. Run the model "Experiment 1 Part 1" from the previous laboratory by applying a square wave input that switches between positive and negative 180 degrees. The motor should turn 360 degrees back and forth and the scope should show the output follows the square wave if the block output is in degrees. Run the model "Experiment 1 Part 1" from the previous laboratory and observe the output signal. Set the amplitude of the dithering signal to 0 and repeat the process. Comment on the differences on the output. (3) Observe the effects of changing the time constant on the noise filter. Apply a sinusoidal wave to the motor block (speed output). Change the time constant on the output filter a number of times and for each case comment on the bandwidth, which is the frequency at which the gain is -3dB in this case. Also, for each different time constant used, apply a constant voltage and comment on the amount of noise in the output. Apply a constant voltage to the motor block (speed output) and record the speed of the motor. Repeat this process for a number of input voltages ranging from -8 V to 8 V. Plot the results and from the graph determine the static gain of the motor. where TC is the time constant or the time for a step response to rise to 63.2% of its final value. Find the motor transfer function from your experiment results and compare the step response of the model and the physical motor. 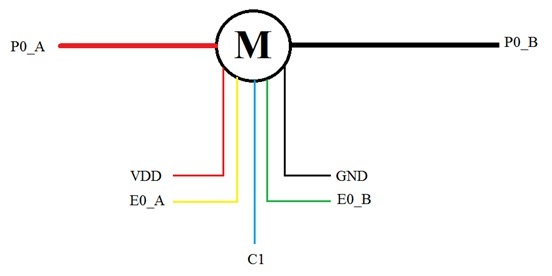 Once the motor is correctly connected to the Hilink control board and the control board is correctly connected to the PC, switch on the power of the Hilink board and start MATLAB. Open the model "Experiment 1 part 1" downloaded in the previous laboratory. If you no longer have this model download it now. Clicking on the signal generator. In the pop up window choose square wave for wave form, 180 for amplitude and 1 hertz for frequency. Close the pup up window. Build the model (by pressing ctrl + B). Connect it and run it by clicking appropriate buttons on the simulink program tool bar. The motor should turn 360 degrees back and forth and the scope should show the output follows the square wave if the block output is in degrees. Repeat this process for the MPradians block by applying a square wave of positive and negative p in order to check if the output is in radians. If not repeat the 3rd task of experiment 1. Once this task is completed set the signal generator back to a sine wave with unit amplitude. Open the model "Experiment 1 part 1" downloaded in the previous laboratory. Build, connect and run the model and observe the waveform. In the model you should notice a sinusoidal block that adds to the signal after the "PID" block. Adjust the amplitude of this wave to zero and repeat the process. Do you notice any differences in the output signals? Is the system without this dithering signal linear or nonlinear? If it is nonlinear, what may cause this nonlinearity and how may this dithering signal reduce the nonlinearity? Try different values of the amplitude and comment on their effects on the output. Summarize your results in a table or graph in order to support your comment. Using the blank template found here construct the following Simulink model. The sine wave block can be found in the source section of the Simulink library or using search. Double click on the "MSradians" block to open up the subsystem. Adjust the time constant of the output filter (coefficient of 's' in the denominator) to zero. Build, connect and run the model. Adjust the frequency of the sine wave until the peak-to-peak value of the output is the same as the peak-to-peak value of the input. This is known as the gain crossover frequency and gives a good indication of the bandwidth. The bandwidth is the frequency at which the gain is 0.707 or -3dB in this case. Note: This will happen at a high frequency in the range of (200-1000 rad/sec). For a time constant of 0 you may find the signal to noise ratio is too low to accurately find the gain crossover frequency. Comment on the effect of the filter time constant on the bandwidth of the system. Replace the sine wave block using a "constant" block with a value of 3. Run the model with each filter time constant used in the previous part. Qualitatively discuss the amount of noise present as the filter time constant is decreased. What are the benefits of using the output filter? What are the disadvantages of using the output filter? Can the use of such a filter be justified assuming there is some trade off? Adjust the time constant of the filter back to its original value. Construct the following Simulink model using the template downloaded earlier. Run the model and wait for the motor to reach steady state. Once the motor has reached steady state record the velocity of the output shaft. Repeat this process for a number of input voltages ranging from -8 V to 8 V. Take a few extra measurements between the range of -2 to 2 V. Record your results in the following table. Once this table is complete plot your results using MATLAB or excel. Is the graph linear? If not the plot is not linear. Is there any regions where the plot is linear? If there are regions where the plot is linear find the gradient. This is known as the static gain of the motor. Note: Line fitting and equation generation can be done using the MATLAB function 'polyfit'. If the plot is nonlinear provide a reason as to why it is nonlinear. If you need a hint go back and read over the preparation. Can this nonlinearity be overcome or is it something that must be recognised but not modelled? Have the final value of the step block to be 6. Build and run the model. Measure the rise time of step response (0-63.2%). where Tc=rise time (0-63.2%). It is the time constant or the time for a step response to rise to 63.2% of its final value. You can add a DC component to the step input using a constant block and a sum block in order to avoid the nonlinearity at zero speed. Using the generic motor transfer function given in the preparation, develop the motor transfer function for both speed and position output. Summarize the overshoots, rise times, delay times and settling times of the motor and the estimated transfer function using a table. Are the results as expected in terms of rise time and steady state value? If not what may have caused these inaccuracies in the model? Does the nonlinearity of the motor play a factor? Does the first order system assumption play a factor? Suggest ways the effect of nonlinearities may be reduced. Remove the output filter for the output by setting its time constant to zero. Repeat Task 5 and compare the results with the results of Task 5. Are there any difference? For analysis and design of a position control system which model should be used, the model obtained in this task or the one of Task 5? Which model should be used for analysis and design of a speed control system, the model obtained in this task or the one of Task 5? Or when the speed model of task 5 should be used and when the speed model of Task 6 should be used?